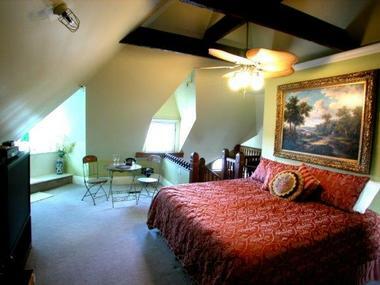 Hines Mansion Bed and Breakfast features nine well-appointed and tastefully decorated guest rooms and suites with distinctive décor and period furnishings, private en-suite bathrooms with two-man jetted tubs, showers, plush towels and bathrobes, and designer toiletries, and modern amenities. 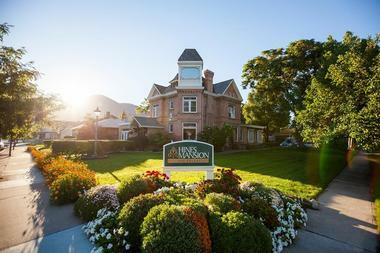 Eagle's Nest is the largest room in the guest house and features eight-foot high vintage windows with spectacular views of Provo and its surrounding mountains. Decorated in a vintage Americana theme, this spacious suite offers a comfortable king-size bed with deluxe linens, an en-suite bathroom with three-sided windows boasting beautiful views, a two-person jetted tub and separate shower, and a spacious sitting area with twin daybed and comfortable seating. Modern amenities include a flat-screen television, ceiling fan, and a mini-fridge. Kitty Hines is a charming room named after the inn’s original host and features classic turn-of-the-century French décor in beautiful shades of blue and creams. This second-floor room offers privacy and peace and has a queen-size bed with deluxe linens, and an en-suite bathroom with a bay window adorned with original stained glass, a two-person jetted tub and separate shower, and plush towels. Modern amenities include a flat-screen television, ceiling fan, and a mini-fridge. Located on the second floor, The Library is decorated to reflect a Victorian study complete with a climbing staircase, a ‘secret passage’ and comfortable furnishings. The room boasts a queen-size four poster bed in deluxe linens, and an en-suite bathroom with a two-person jetted tub beneath a skylight, a separate shower, plush towels and branded toiletries. Modern amenities include a flat-screen television, ceiling fan, and a mini-fridge. Delighting the senses with hues of white and blue, the Seaside Retreat room takes guests on a journey to far shores with a queen-size four poster bed with deluxe linens, and an en-suite bathroom with a two-person jetted tub beneath a skylight, a separate shower, plush towels and branded toiletries. Decorated to reflect the beauty and tranquility of an English countryside with vine-wrapped walls, floral accents, and colorful hues, the Secret Garden boasts a king-size four-poster bed with deluxe linens, and an en-suite bathroom with a rain shower, plush towels and branded toiletries, and comfortable furnishings. The rustic, Western-themed room called The Lodge offers a cabin-in-the-woods type experience with a king-sized, lodge-pole pine bed dressed in deluxe linens, an en-suite bathroom with a two-person jetted tub that doubles as a shower, vanities, plush towels and organic bath products and a cozy sitting area with comfortable seating. The Victorian Rose exudes the ambiance of a bygone era with elegant lace curtains, period floral wallpaper and an antique wood and glass door. The room has a queen-size four poster bed in deluxe linens, and an en-suite bathroom with a two-person jetted tub, a separate shower, plush towels and branded toiletries. Modern amenities include a flat-screen television, ceiling fan, and a mini-fridge. 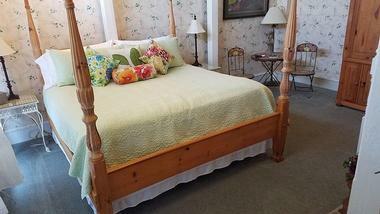 Located on the ground floor and reminiscent of a Southern cottage surrounded by magnolia gardens, the nature-themed Whispering Willow room has its own outside entrance and features a queen-size four poster bed in deluxe linens, and an en-suite bathroom with a two-person jetted tub, a separate shower, plush towels and branded toiletries. Winter Dreams transports guests to another place and time with its warm, hand-carved mahogany and rich, dark tones and hues. The grand room features comfortable queen-sized four poster bed dressed in deluxe linens, and an en-suite bathroom with a shower, plush towels and branded toiletries. Modern amenities include a flat-screen television, ceiling fan, and a mini-fridge. Every morning a sumptuous continental breakfast is served in the sunny dining room or out on the lovely patio with beautiful garden views. The delicious continental breakfast buffet features cereals and oatmeal, baked goods and pastries, cheese and homemade jam, egg dishes, fresh fruit platters and squeezed juices, organic teas, and freshly roasted coffee. In addition to breakfast, guests can also enjoy freshly baked cookies or muffins in the evenings along with fresh fruit and popcorn for those late night munchies. Special treats such as strawberries and cream and other items are available on request. 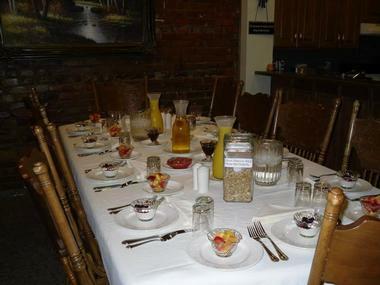 Hines Mansion Bed and Breakfast serves a complimentary gourmet breakfast every morning, freshly baked cookies or muffins in the evening, and snacks for late night munchies. Special treats such as strawberries and cream and other items are available on request. The Inn also offers beautiful venues for special functions and events, business meetings and family gatherings, including the beautiful gardens and the elegant Victorian parlor. 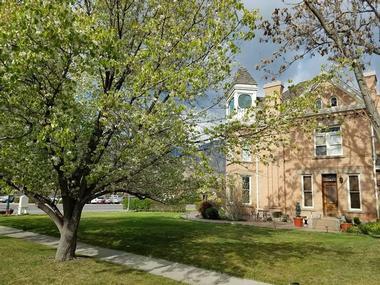 Hines Mansion Bed and Breakfast offers beautiful venues for special functions and events, business meetings and family gatherings, including the beautiful gardens and the elegant Victorian parlor with its marble fireplace. 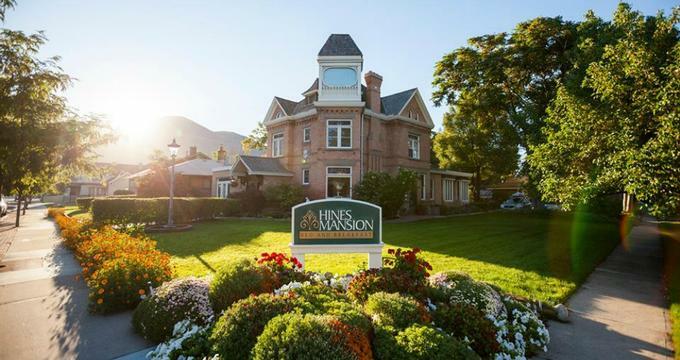 Hines Mansion Bed and Breakfast is conveniently located near Utah Lake and offers a variety of many things to do in and around Provo including hiking, mountain biking, horseback riding, fishing on Utah Lake, and dog-sledding, snowmobiling and more in the winter.